CAMP ATTERBURY JOINT MANEUVER TRAINING CENTER, Ind. – The call for a medical assist echoed over the radio strapped to 22-year-old, Camp Atterbury Military Police Officer Spc. Stephen Strebinger’s right shoulder on the rainy afternoon. “Roger, I’m en route,” replied the South Bend, Ind., native as he flipped on his siren and lights. He sped to the location relayed to him. He arrived on the scene and immediately began assessing the situation. He noticed a man laid back in the driver’s seat of a minivan, unconscious. The van’s engine was off but the keys were still in the ignition and the door was unlocked. Three years earlier, Strebinger’s father died of heart failure and because of this loss, Strebinger prepared himself for the very situation that occurred in September. The loss inspired him to learn to save lives and perhaps follow in his father’s professional footsteps as a caregiver. His father was a registered nurse at the intensive care unit of the Memorial Hospital of South Bend. “Some of the nurses [at his father’s place of employment] that I’ve been really good friends with for some time, got me into a couple of classes,” said Strebinger. He earned certifications to administer cardiopulmonary resuscitation and to use an automated external defibrillator, techniques and tools used to revive patients who have stopped breathing or are in cardiac arrest or both. 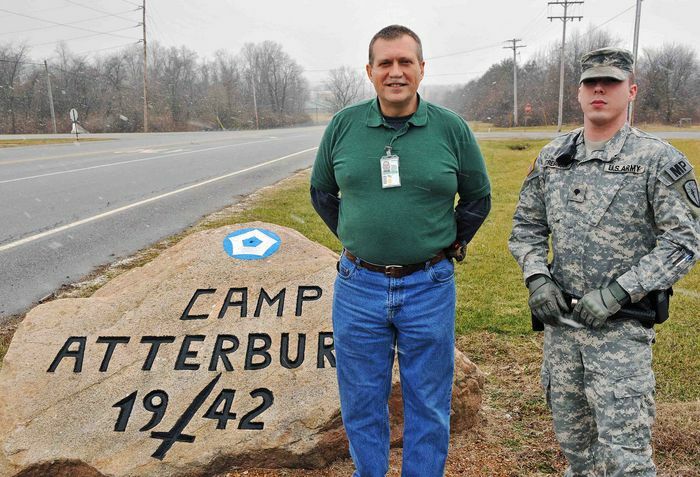 As a military police officer he was also required to take the military healthcare provider course at Camp Atterbury. 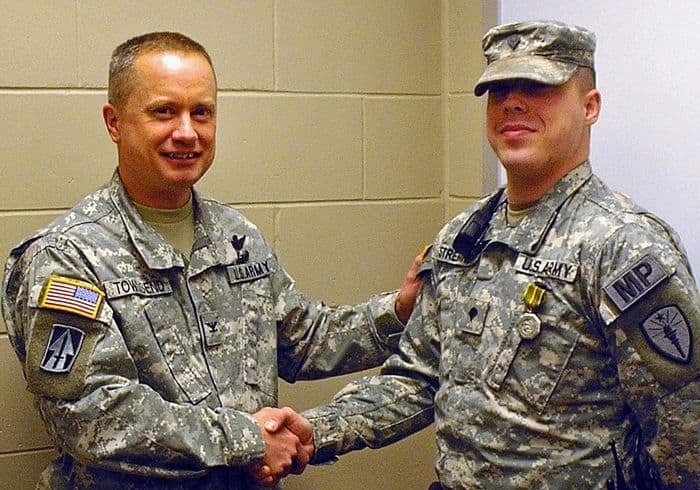 Additionally, Strebinger volunteered and took the Army’s combat lifesaver’s course. The scenarios he had trained for were now a reality. He ran back to his patrol vehicle that day to retrieve the defibrillator and protective breathing mask. The automated external defibrillator, or AED, is a tool that automatically diagnoses heart rhythm and determines if a shock is needed, guiding the user through a step-by-step electronic voice prompt. Strebinger returned to the dying man with the lifesaving equipment. He used his knife to cut the patient’s shirt open just as the Camp Atterbury medics arrived at the scene. Wasting no time, he placed the paddles accordingly, one on the man’s side and one on his chest, allowing the machine to measure his vitals. “The AED told us to stand clear as it took his vitals and seven to 10 seconds later it told us ‘shock advised’,” said Strebinger. Strebinger initiated the shock and was successful in restoring the man’s heartbeat less than four minutes from arriving on the scene. “I got on the radio, reported the shock and called for a [medical evacuation],” he said. The patient, however, still wasn’t breathing. Strebinger worked with the medics, taking turns applying mouth-to-mouth resuscitation, breathing into the man’s lungs ensuring that precious oxygen was pumping to the man’s brain. Simultaneously, as more MPs arrived on the scene, he ordered them to cordon off the street so that a helicopter from Columbus Regional Hospital could use a landing pad across the street and evacuate the patient. 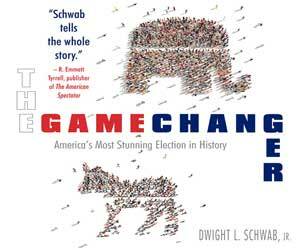 But as they waited for the helicopter, the rain began to pour. The helicopter was grounded. They would need to send for a ground ambulance instead to come as fast as it could to evacuate the patient. Meanwhile, Strebinger and the medics continued taking turns giving mouth-to-mouth to the patient. “At that time the man began breathing again,” said Strebinger. “The medics applied suction to his mouth. He was falling in and out of consciousness but he had a strong heart beat.” The civilian ambulance arrived on the scene shortly after and began readying him for evacuation. The patient was safely and successfully escorted to the Columbus Regional Hospital in Columbus, about 10 miles north of Camp Atterbury. “His family stopped by four days after the event and gave all of the medics and officers that responded to the call that day a personalized written card thanking us with their children’s signatures on it,” said Strebinger. “We were glad to know he was ok.” Strebinger was awarded the Indiana Distinguished Service Medal on Jan. 7 for his actions that rainy September afternoon. The fact that they really [actually] saved my life.” Trowbridge paused. “My family and I couldn’t be more grateful.” Strebinger has since earned a nickname among the other members of his unit since the dramatic events that took place last fall. “We call him the doctor,” said Staff Sgt. 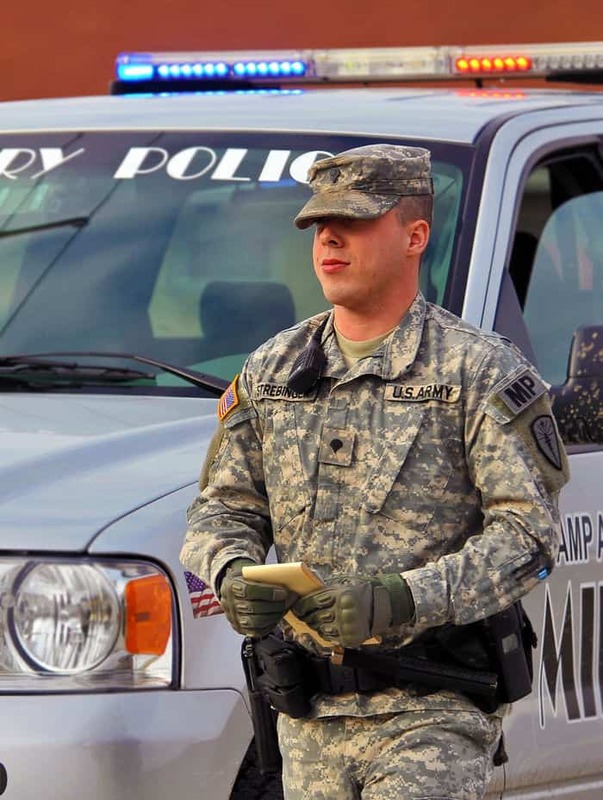 Royce Wagner, Camp Atterbury military police non-commissioned officer in charge. “It was a very proud moment for me as a supervisor. He was extremely knowledgeable and professional in knowing what he needed to do as an MP to help preserve the safety, security and health of our Soldiers and civilians here. I think he is extremely deserving of his award.” Still, Strebinger remains humble and stays ready to face situations of this nature in the future. “It’s not every day a Soldier gets this award but to me I was just doing my job,” said Strebinger. “I am grateful that I was able to carry out my duties that day.” “It’s not something that I would want to do again,” said Strebinger, “But if it does arise it makes me feel good that I was able to help somebody out like that. He has a family. If I hadn’t gotten there fast enough or if the equipment failed.